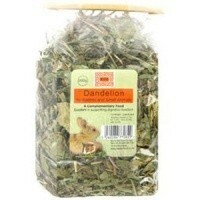 Burns Wholed Dandelion for Small Animals 100g is a pack of natural dried dandelion to provide your pet with the fibre they require to maintain excellent health. This tasty dried herbal supplement feed support the urinary tract of your pet, as well as contributing to the maintain of its overall health. To be fed alongside hay and other herbs for a balanced diet.